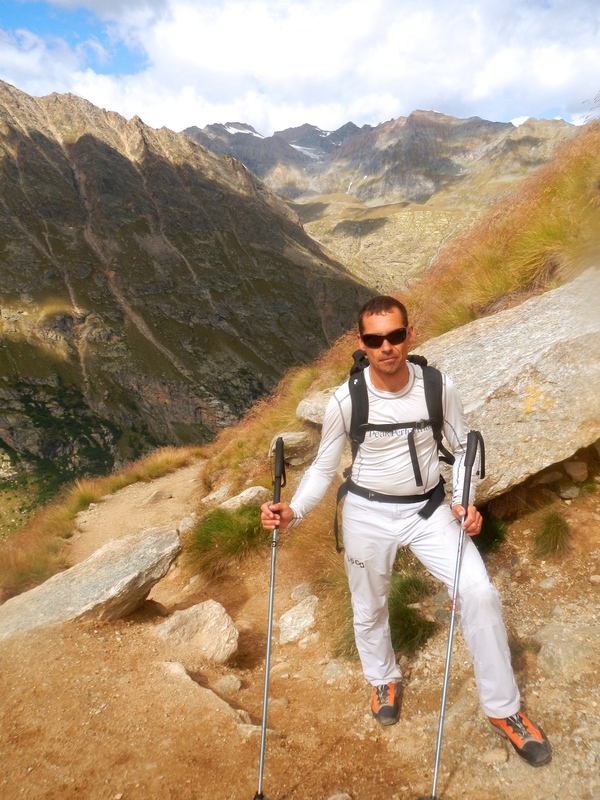 In July 2010, a friend and I set out to climb Gran Paradiso as a training climb before attempting Mont Blanc. 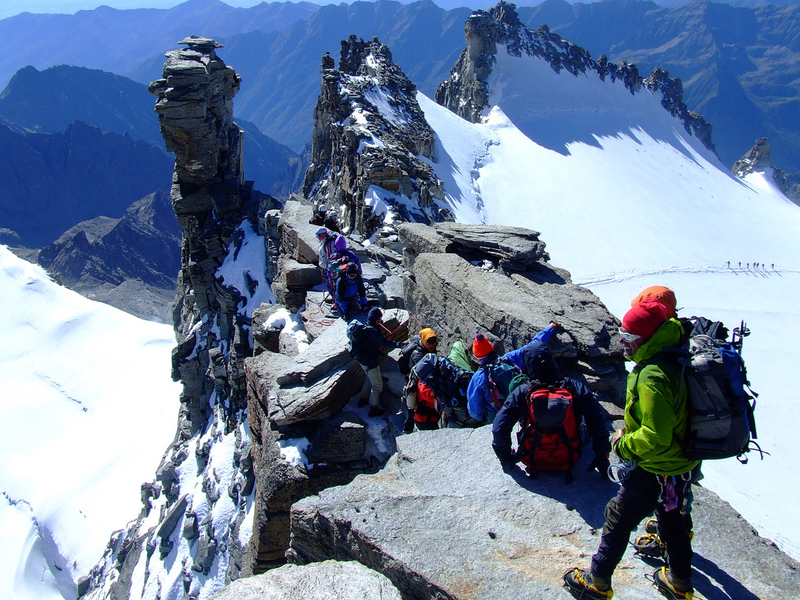 Gran Paradiso is the only 4,000 metre peak that is entirely within Italian territory. The Italian-French border runs along the Alps and over the Mont Blanc summit, so there are a number of higher mountains “in Italy”. Unfortunately, my friend had some altitude sickness at around 3,700 metres and, on the advice of our guide, we turned and headed back down. So in the summer of 2014, I decided to complete the climb. 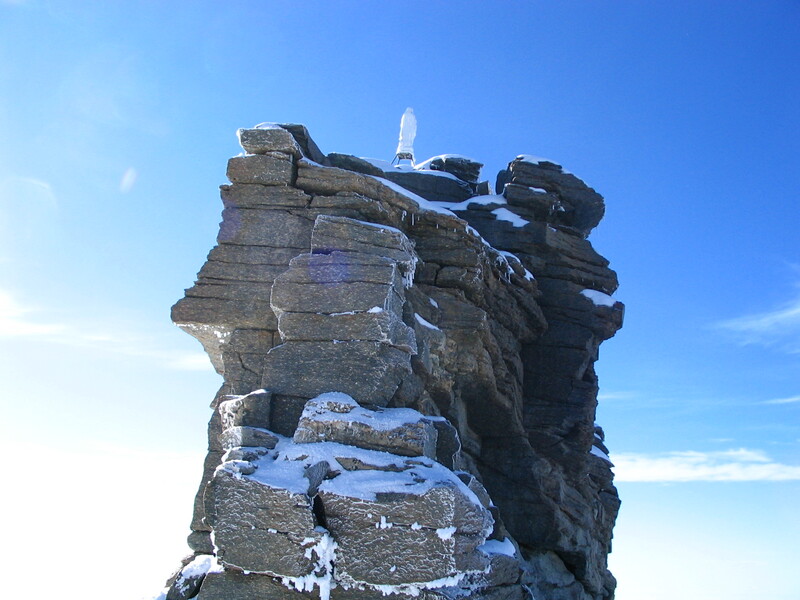 Here is a photo, taken from the internet, of the summit ridge of Gran Paradiso (4,061m) in fine weather. 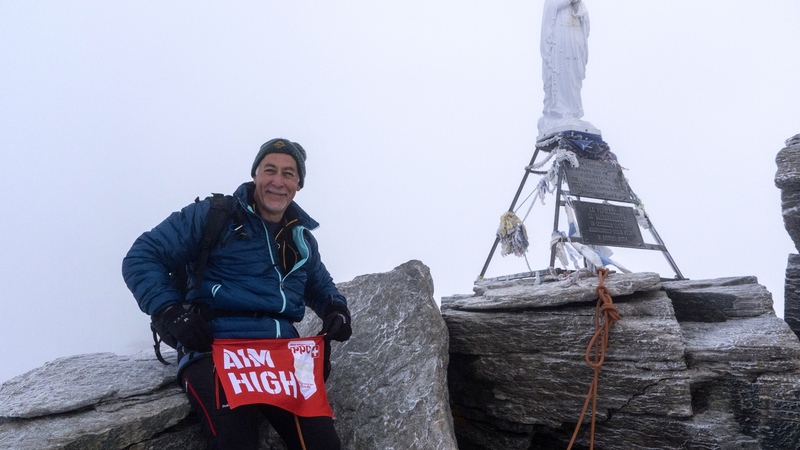 So last week, I took two days and headed for Gran Paradiso with Yannick Flugi, who I’ve done a number of climbs with over the last few years, including that first attempt in 2010. We set off from Geneva on Thursday morning at 10 am, and headed through the Mont Blanc Tunnel to the Valsavaranche valley, where we left the car at a small hamlet called “Pont” (1951m). Setting off soon after midday in brilliant sunshine, we made good time up a steep path to reach the Vittorio Emanuele Mountain Hut (2735m) in one and a half hours. After arriving at the hut and enjoying some local refreshments, Yannick had a nap and I found a quiet spot to do some sunbaking and relaxing. After dinner at 7 pm, with that essential pasta for ‘carbo-loading’ for the next day, and several glasses of a very nice Barbarossa red wine, we settled down for an early night. 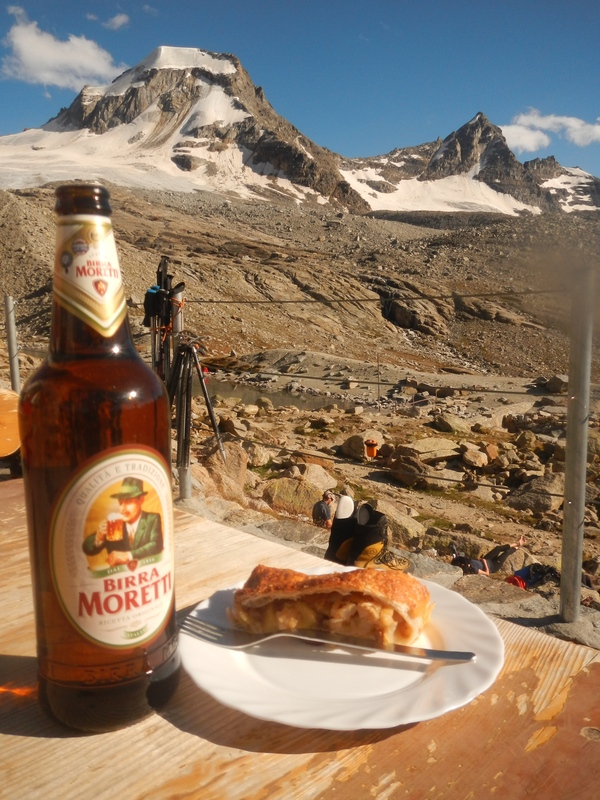 Enjoying a beer and apple turnover with a view of Piccolo Paradiso. Up at 4 am for a quick breakfast (coffee, toast, jam) and get into our climbing gear, including harness and a headlamp for the first few hours. 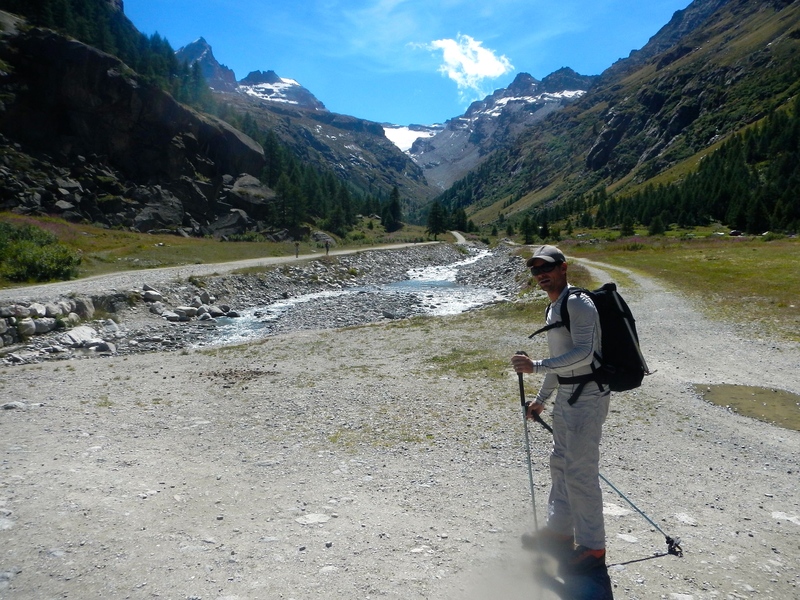 Set off at 4.15 am, up a rocky, barely visible “path” into a valley leading up and on to the glacier. That’s me, dressed and ready to go. 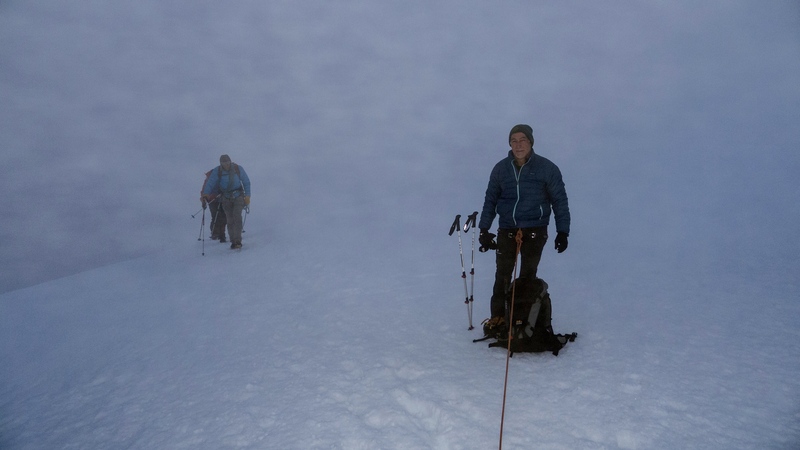 We reached the glacier after about an hour of scrambling in the dark, put our crampons on and roped up. 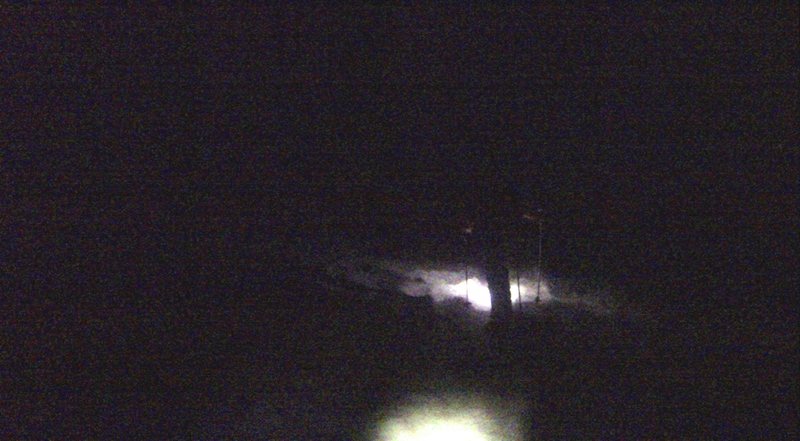 Starting to ascend the glacier by headlamp light. 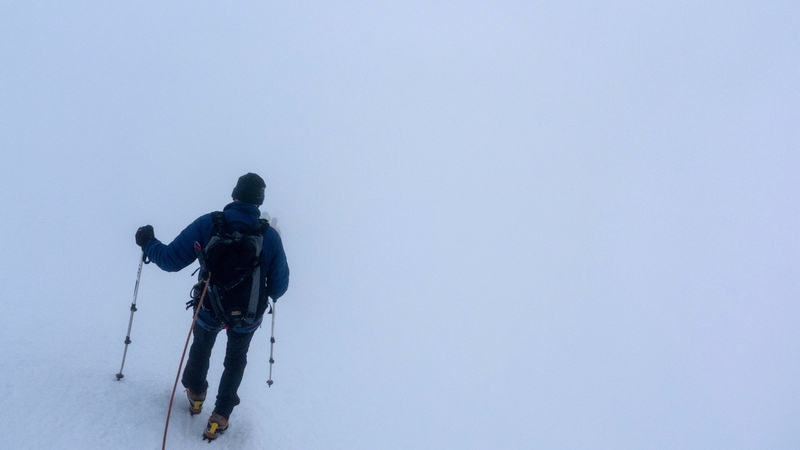 Roped together, we established a good rhythm and made a steady ascent on the glacier, steep at times, and were soon enough in the clouds with relatively low visibility (perhaps 10 to 20 m). 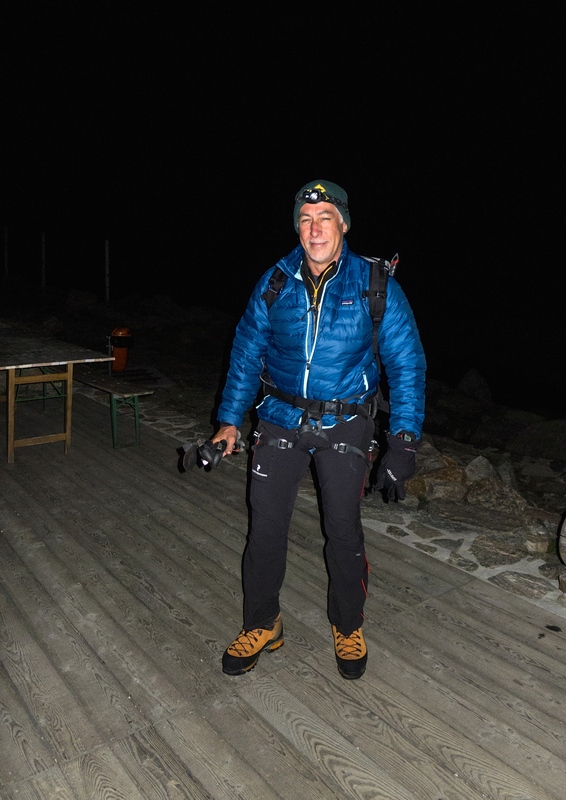 At times there were breaks in the cloud and we caught glimpses of the surrounding peaks and the Alps in the distance to the north, as the sky gradually lightened towards dawn. 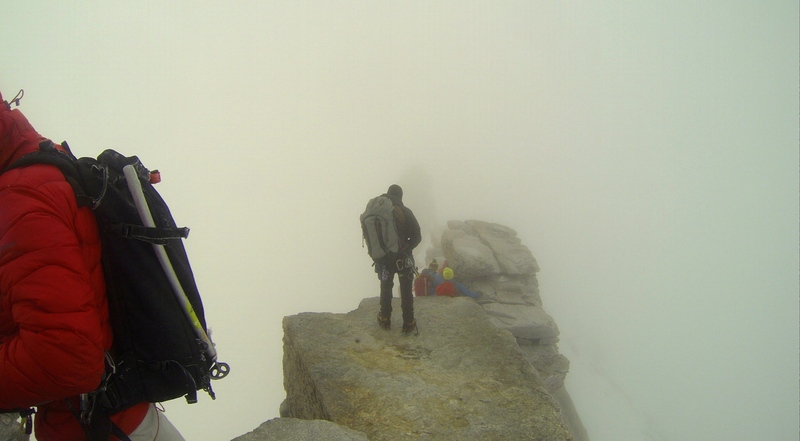 We got a little disoriented in the low visibility and climbed up to some rocky outcrops with a big drop before Yannick figured out which direction to head towards the summit. A bit more climbing took us to a flatter section at 3800m before the final steepening and access to the summit ridge at 4000m. At this point, the clouds cleared for a minute or two and we had a spectacular view of the summit ridge up ahead. 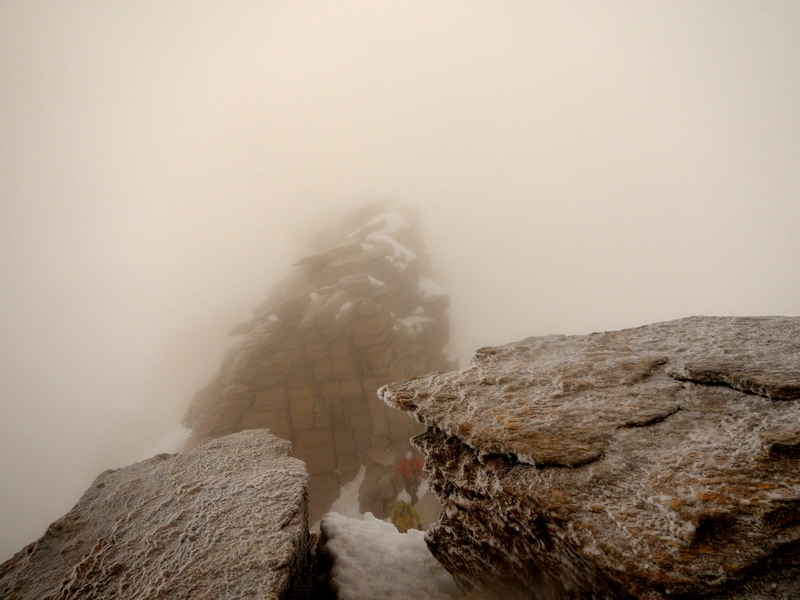 The summit ridge presents an exposed but relatively easy scramble to the summit. However, the visibility was again low and there was a wind blowing that was very cold. I was wearing my thin goretex gloves, and the fingers of my right hand had started to get painfully cold. 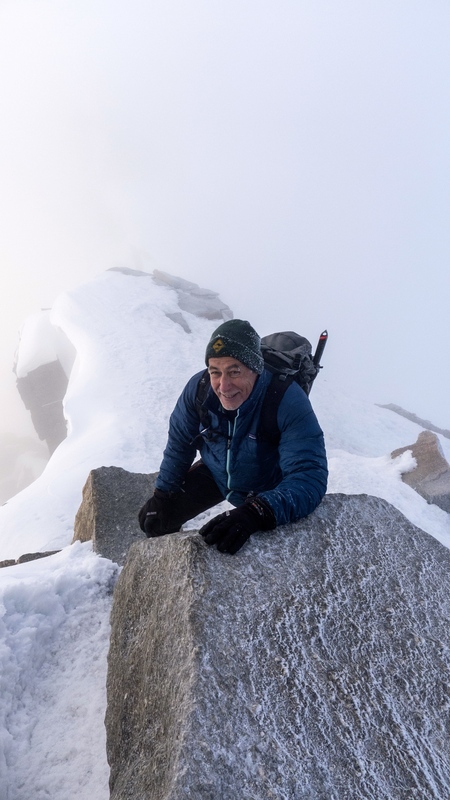 We climbed up and along the rocky outcrops of the summit ridge, mostly moving together roped, but in a few places using some metal bolts in place to set up belays. The “crux” was a short ledge on the vertical side of a block of rock. It was about boot width and there was a convenient crack at chest height for handholds, however, there was a substantial amount of air below my feet. Looking back towards the “crux” (lower climbers in the distance). 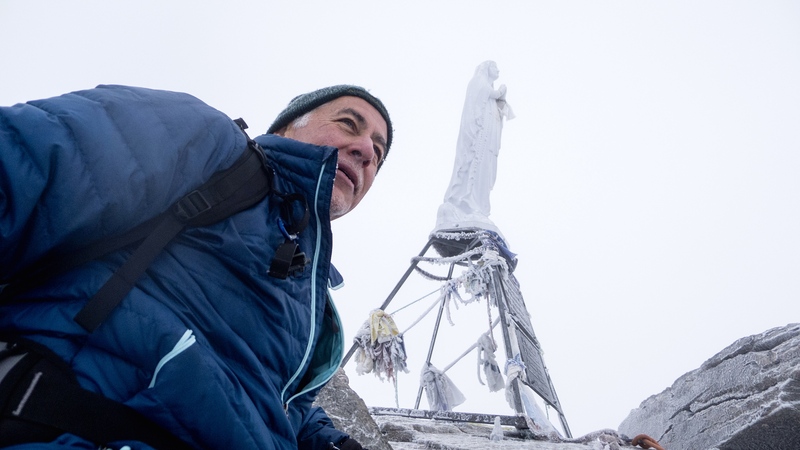 After a 4.15 am start, we were on the summit by 8.30 am, all in all it was a quite fast ascent. 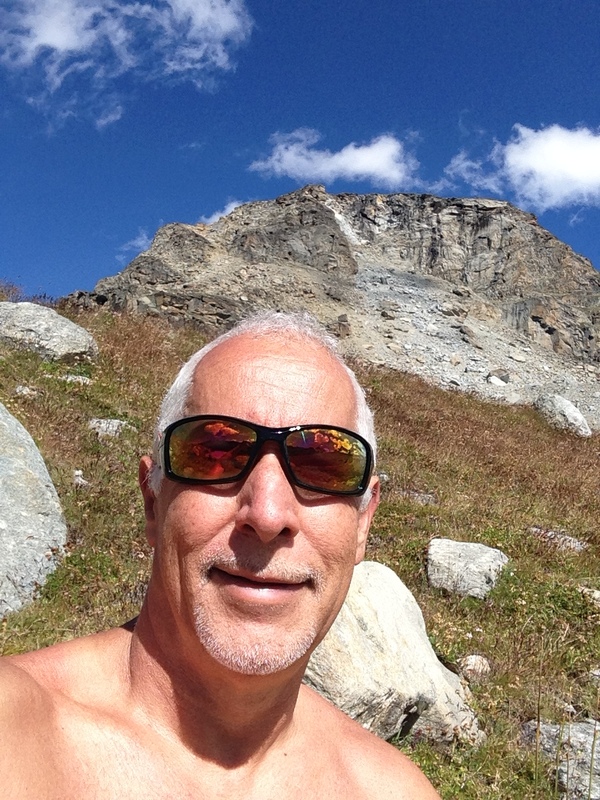 I felt pretty pleased that my fitness was clearly better than the last time I had been on this mountain four years ago. 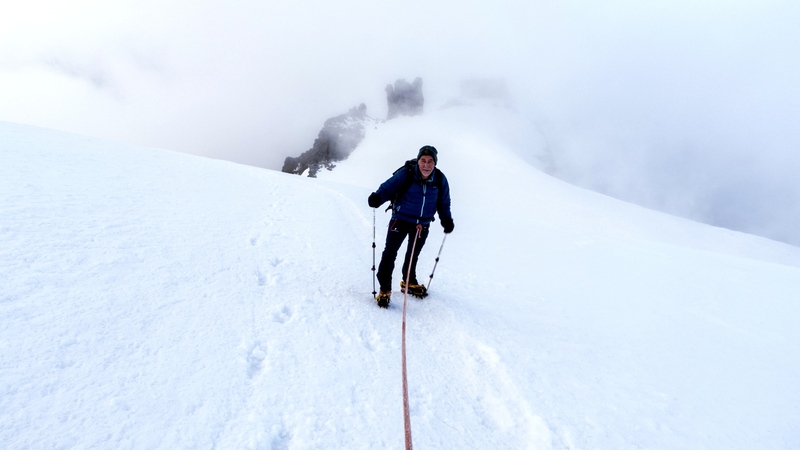 We headed back down the glacier, with Yannick’s encouragement I was taking big steps in the crampons and letting gravity move me down fast. There was only once I got myself tripped up and lost my balance. But before I could fall anywhere, Yannick yanked hard on the rope joining us and put me flat on my back, driving all the air out of me. 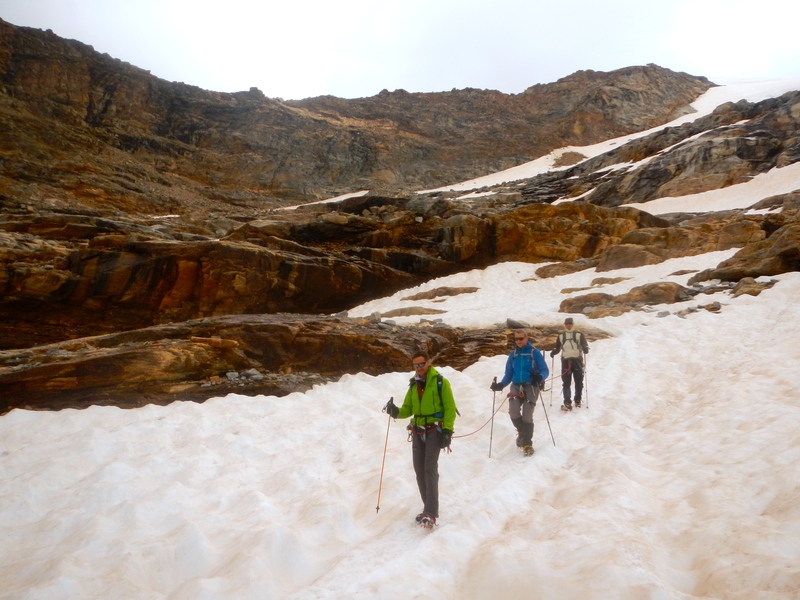 At the bottom of the glacier, we stopped to take off crampons and remove several layers of clothing. 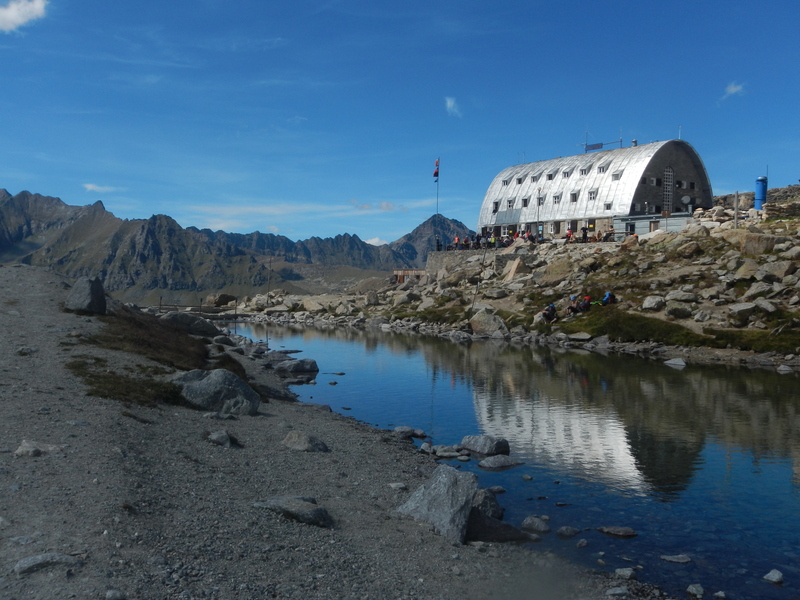 After a drink and a snack, there was about 45 minutes of rock hopping down the valley to the hut. Just before we reached the hut, I twisted my ankle on a rock. The descent from the hut to the valley and the car was slower as a result and took us almost as long as the climb up. Although we were back at the car early afternoon, it had been a reasonably long day considering the 4 am start. And the descent from summit to car was an overall height drop of over 2100 m. Considering that, the knees were not doing too badly! Yannick on the track down from the hut to the valley. Me towards the end of the descent to the valley. 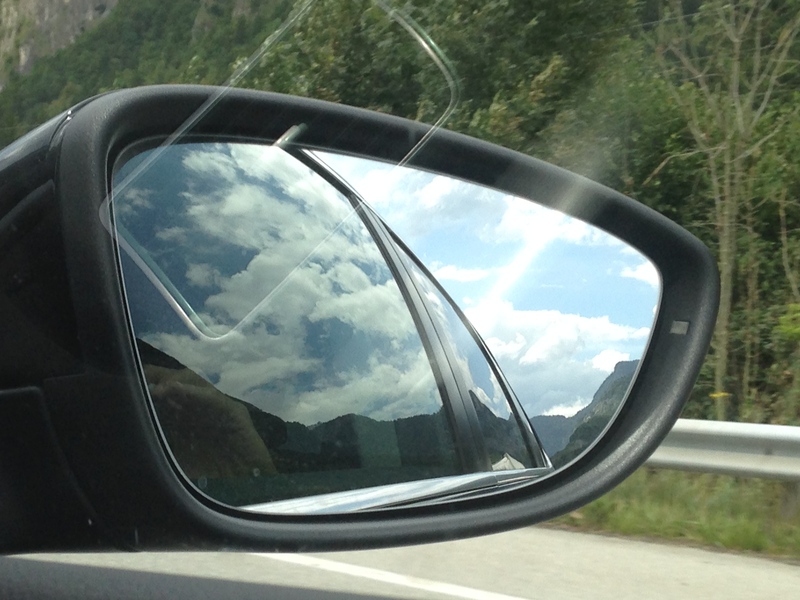 After a well deserved drink and ice cream, we got in the car and headed north towards Mont Blanc. Some delay at the tunnel, and then back to Geneva and the cloudy rainy skies of Switzerland. 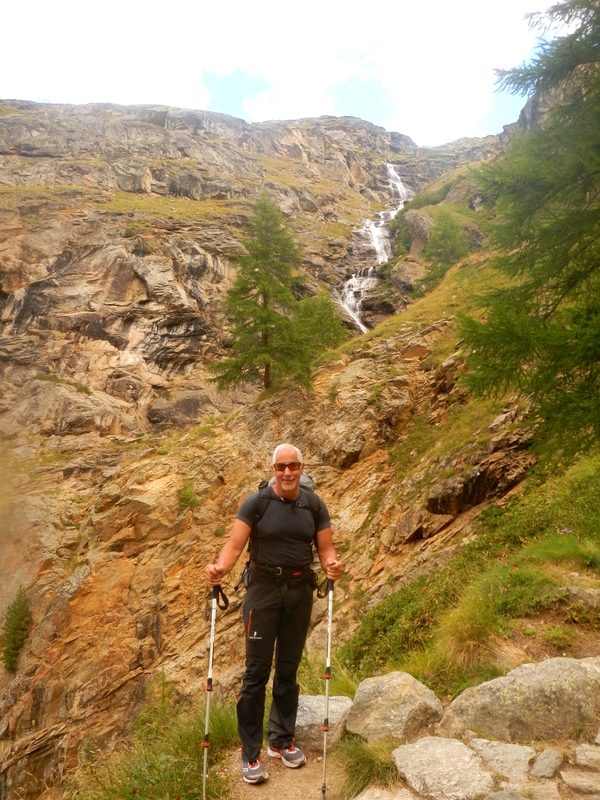 This entry was posted in Mountains, Photography and tagged Alps, climbing, Gran Paradiso, Italy, mountaineering by colinmathers. Bookmark the permalink.